In the section community sites, we present programmes, networks and institutions in the field of foresight, forward-looking activities and future studies. The short description introduces the organisation or network and the icon forwards you to the link. GlobalForesight.org is an ASF (Acceleration Studies Foundation) is an nonprofit engaged in outreach, education, research, and selective advocacy with respect to issues of accelerating change) nitiative to find and connect foresight students and alums and foresight professionals, researchers, and educators, and steer them to the best current social networks and meet ups, events, orgs, and resources for advancing global foresight culture. The Department for Business, Innovation & Skills (BIS) is the UK department for economic growth. The department invests in skills and education to promote trade, boost innovation and help people to start and grow a business. BIS also protects consumers and reduces the impact of regulation. BIS uses the latest scientific and other evidence combined with futures analysis to tackle complex issues and help policy makers make decisions affecting the future. With a world-wide network of colleagues and fellows, they are earning a global reputation as pioneers of the next generation of futures research and strategic foresight. An integrated, reflexive and conscious human capacity to see, think through and do what needs to be done NOW in light of the trajectory-altering implications of the signals of contextual change, while there is still time to act creatively and pro-actively – before hidden opportunities are lost and unseen threats have become crises. Futuribles is an independent non-profit center for prospective studies and foresight. Its overall aim is to contribute to a better understanding of the contemporary world. To become a member of futuribles you have to pay membership fee that provides access to a number of products and services. 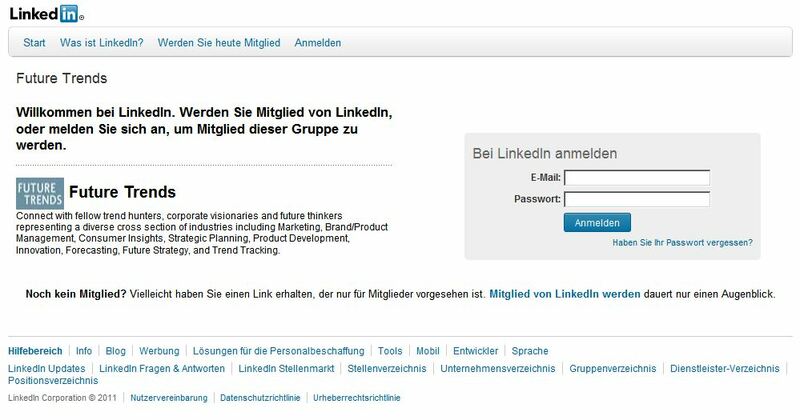 The LinkedIn “Future Trends” Group offers the possibility to connect with fellow trend hunters, corporate visionaries and future thinkers representing a diverse cross section of industries including Marketing, Brand/Product Management, Consumer Insights, Strategic Planning, Product Development, Innovation, Forecasting, Future Strategy, and Trend Tracking. It’s a business platform, which is for free, so everyone can find new contacts without paying. Memebox lines-up many of future-focused applications that include Future Scanner, Future Blogger, the Future 500, and the ever-growing hosted domain blogs such as The Energy Roadmap.com and Scenario Land.com. Together, these sites offer a unique sounding-board for foresighted ideas of all shapes, sizes and media. As a member of the Global Business Development Network, Foresight 2020 Offices’ mission is to foster a debate based on sound information about the business opportunities in the scope of Biotechnology, Energy and Environment, Information Technology, Communications and the Agribusiness. With its nearly 2900 members, form all over the world, it is a “small” network. The network’s goals are to help members add real value to their professional, academic and personal life in the form of shared knowledge, opportunities, experiences and guidance.They encourage members to listen and learn from each other, anticipate change, explore next practice, find new opportunities to collaborate and to co-create the future. The World Foresight Forum is a global initiative that strives for a secure and sustainable world for future generations. It must be built upon safety, security and justice for the many. The Foundation is a joint initiative of Granaria Holdings, Hague Centre for Strategic Studies and TNO. As a nonprofit, nonpartisan association, the World Future Society relies almost exclusively on membership fees and on the generous support of its members. The World Future Society strives to serve as a neutral clearinghouse for ideas about the future. Ideas about the future include forecasts, recommendations, and alternative scenarios. The WFSF seeks to assure complete freedom of activity and discussion among its members and within the Federation. To achieve this goal, the Federation seeks close cooperation with educational, scientific, cultural, artistic, and other institutions, associations, and organizations in all fields of futures studies, especially within the United Nations family. To become a member you have to pay the membership fees. You will quarterly get a newsletter and you can discuss different topics in an online platform.